Jeremy Webb walks his pig to the exhibit hall to be judged Thursday. The Box Elder County Fair was off to great start as the Thursday crowds began to descend on Tremonton’s fairgrounds. Joan Hamer, Box Elder tourism director, said as far as the exhibits went they were pretty robust. “The weather is cool; there has been a steady stream of people coming through the gate,” she said about noon on Thursday. She said the event does bring in tourists. All of the hotels in the area will be sold out. People come home for the fair. She said for the past few year they have auctioned off over a million dollars of livestock raised by children. As the day went on Thursday the crowd continued to grow. Roy Hadley, 87, with his blue Y cap on his head and his wife Marilyn, 83, were taking it all in. The two were sitting on a bench outside one of the exhibit halls, people watching, and taking a break in the afternoon sun. “We’ve been coming to the fair since we were little,” Marilyn exclaimed. Randy Burgess, of the band Flash Back, sang and played 60’s tunes on his guitar to a small crowd at the bandstand. 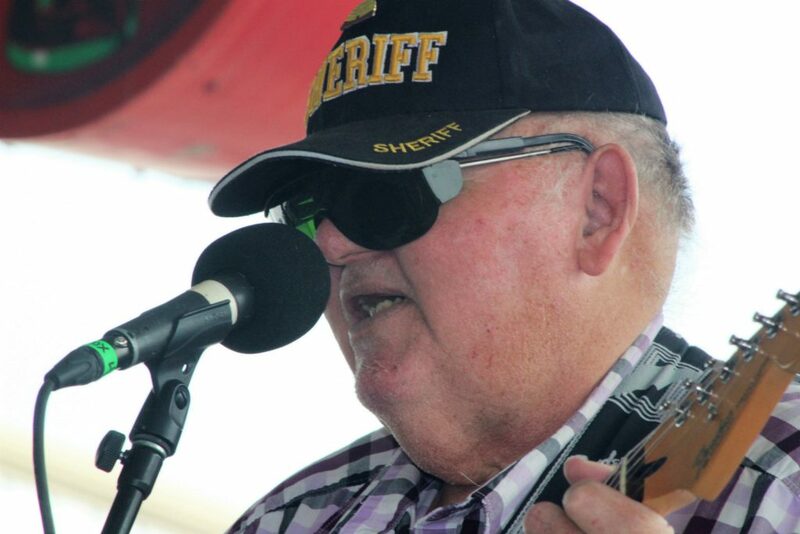 For 40 years the Ogden entertainer has been playing for crowds throughout Northern Utah. 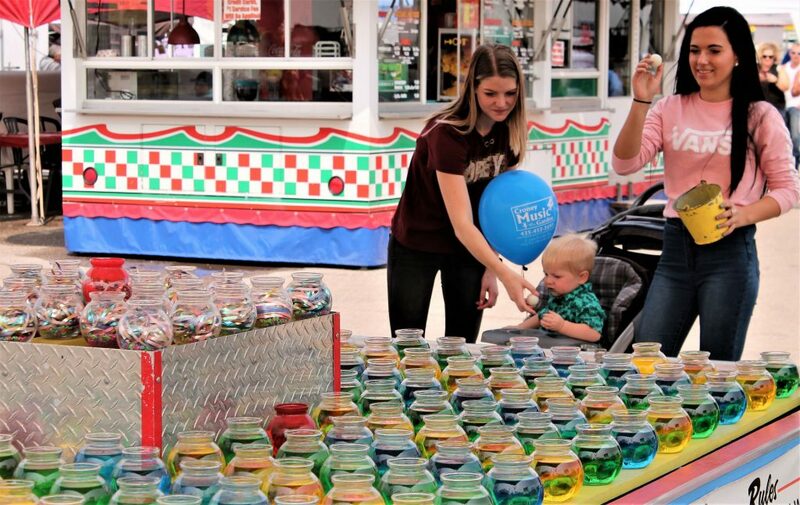 Kylee Boren and her friend Hadley Stenberg, with Daxton Stenberg in his stroller, were trying to win goldfish by throwing ping pong balls into tabletop small fishbowls filled with colored water. They didn’t win a fish, but they left with smiles on their faces. Tate Craner, 5, is excited to play with a bunny in the Small Animal Exhibit Hall at the County Fair on Thursday. Tate Craner, five, was excited to pet a baby bunny in the small animal shelter where the rest of the bunnies were displayed along with chickens and pigeons. Jeremy and Jessica Webb were washing their pigs down getting them ready to show their projects to the judges. The pigs were pretty cooperative considering the many bystanders there to distract them. As for the food, lunch time brought people to anywhere there was a window open. It looked like all of the stands had long lines. The fair must be the place to in Box Elder County for the next few days. Friday events will start at 8 a.m. with Horse Show events and different happenings all day. The final performance before the rodeo starts will be “Sun Shade and Rain’” at the bandstand starting at 6:30 p.m.
Saturday morning events begin at 7:15 a.m. with a 2 mile walk. The last act before the rodeo will be “Fog,” performing at 7 p.m. at the bandstand. There will also be entertainment after the rodeo each night. Hadlee Stenberg, Dexton Stenberg, in the stroller and Kylee Boren try to throw a ball in the fish bowls to win a gold fish Thursday at the Fair. 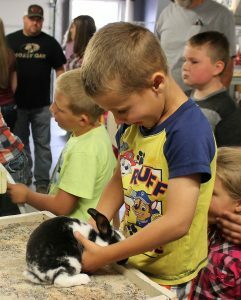 Tate Craner, 5 is excited to play with a bunny int he Small Animal Exhibit a the County Fair on Thursday. Randy Burgess sings with his group "Flash Back" at the Bandstand at the Franklin County Fair on Thursday. 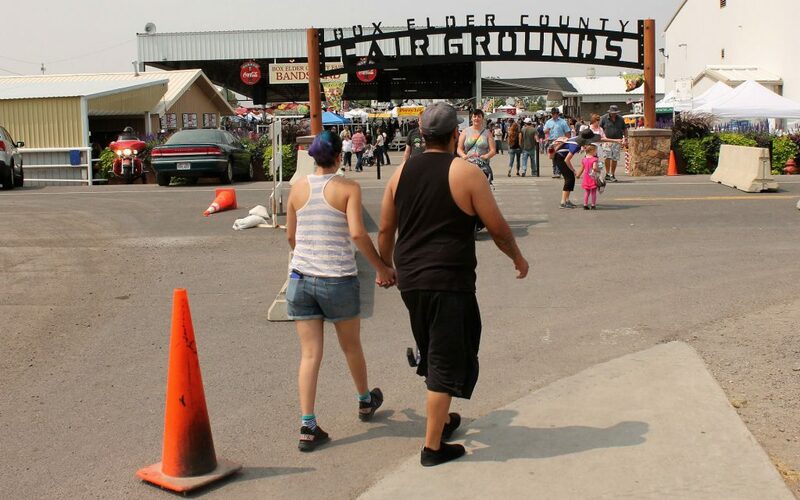 Crowds were beginning to arrive at the Box Elder County Fair as soon as the gate opened Thursday, Aug. 23. 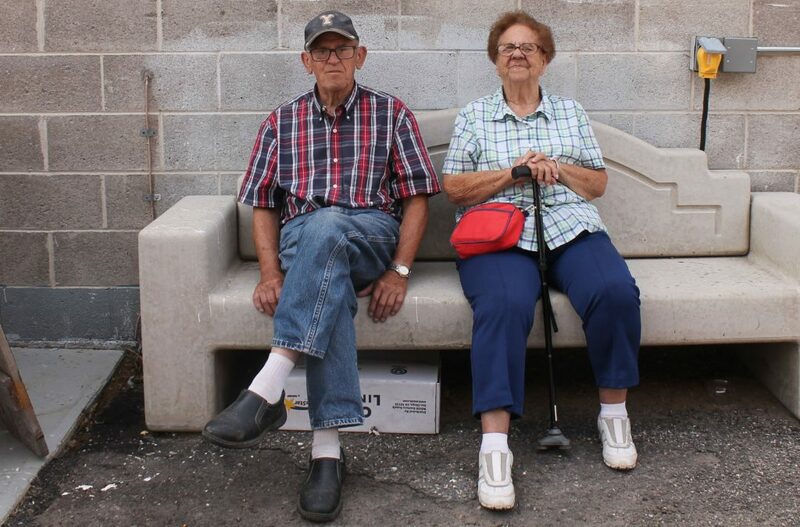 Roy and Marilyn Hadley have been going to the Box Elder County Fair since the were little. Now in their 80's they still make a day of it. 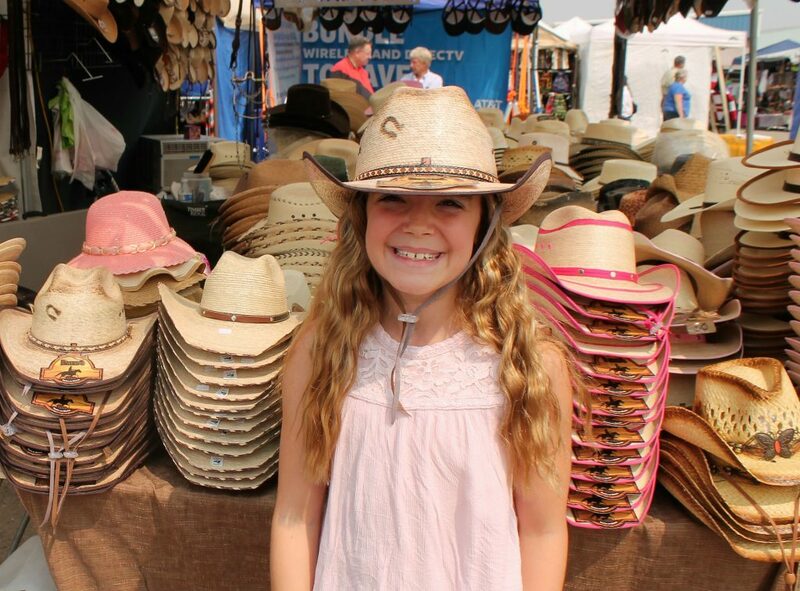 Sariah Austin, 10, was looking for the right hat to buy at the Franklin County Fair on Thursday afternoon. 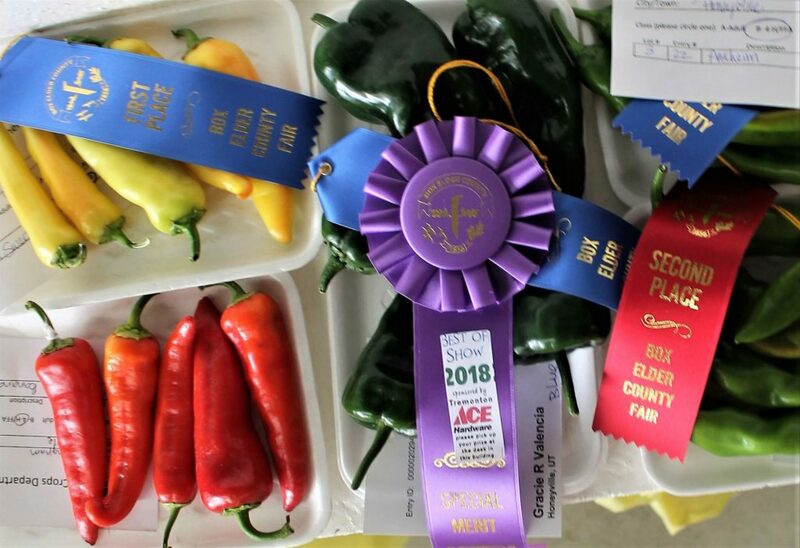 Gracie Valencia won a Special Merit ribbon at the box Elder County Fair for her green pepper entry.